Fatidique in the French dictionary Larousse is defined as follows: Qui dÃ©voile ce que les destins ont ordonnÃ©; or in English: Unveling what Destiny has decreed. A characteristic of the Eight Dances is that they re[resent various locales of the world as well as different eras or periods of time. The Gavotte recalls Versailles and the days of Queen Marie-Antoinette. The Menuet is very powder-puff as the French would say. It also brings back memories of the elegant 18th century. The Polka, or Pulka, originated in Bohemia and Poland. At the age of five, Carlos Salzedo wrote a Polka- his first printed composition- and the memory of that little piece came to him while he was composing this Suite of Dances. He recalled the youthful theme and transformed it, with an added touch of the grotesque. This Siciliana is a modernized conception of a classic Italian dance. The Bolero, like the Spanish Fandango, is of Moroccan origin. We have been made aware of the impact of this dance form by Maurice Ravel s famous Bolero for Orchestra. 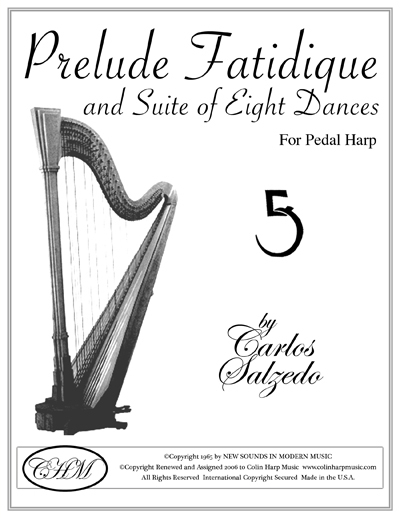 Carlos Salzedo has revealed within the confines of a shorter Bolero for Harp the tonal resources of that instrument. He has made subtle use of the dynamic range of the harp and had intensified the sonorous effect of the climax by a sudden drop to unexpected softness and a final pianissimo. The Seguidilla is a quick, happy Spanish dance. The Tango, a national dance form of Argentina, is a languorous melody set to the background of a rigid accompaniment. It is similar to the Spanish Habanera, which was imported into Cuba from Africa. The Rumba is a family of music rhythms and dance styles that originated in Africa and were introduced to Cuba and the New World by African slaves.